Here we are at the start of February, and it's a very exciting day today. 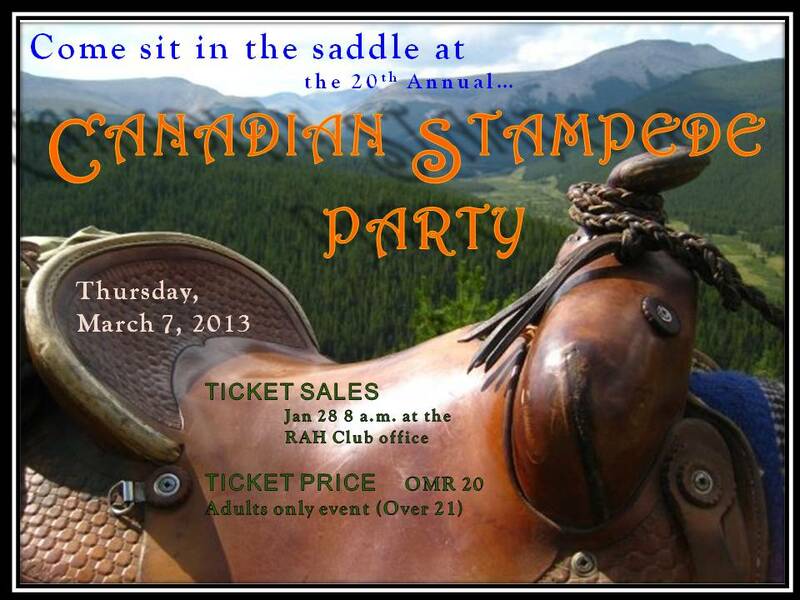 Regular readers will know that I am completely biased by all things Canadian and have been a long time supporter of the best party in Muscat that is thrown every year: The Canadian Stampede, which is on Thursday March 7th at the Ras Al Hamra club from 7:30pm. This year is a major milestone for the Stampede - it is the 20th Annual one, which as it turns out is the single longest running Stampede party of it's kind outside of the main one in Calgary which is held every year (they are having their 101st this July). Tickets go on sale today, they cost RO 20 each. You can buy tickets at the RAH administration office from this morning - if you are a RAH club member... if not, you need to be friends with someone who is a member of the RAH club.... or you can email me on mrsythe[at]gmail[dot]com and I will help you get your hands on tickets to the best party in town. If you don't believe me, ask people around town - this gig sells out quickly - because it's very popular. A change this year: there are rumours of a live band! Please keep me 2 tickets for now. Maybe more will be needed - will let you know. I have 2 extra tickets for CANADIAN STAMPEDE.